This should end forever the Democratic Party created fantasy that President Trump and his campaign were in some way working with the Russians to impact the results of 2016 presidential election. This ends almost three years of investigation into candidate and then President Donald Trump in relation to Russia. Every media outlet owes President Trump a non-stop apology for their continued claims that there was a conspiracy and that his presidency was illegitimate. 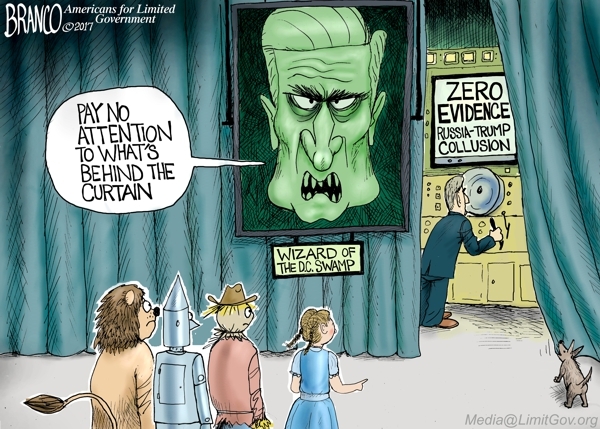 Mueller ended his investigation with zero prosecutions of Trump campaign officials for conspiracy with Russia to hack the DNC and Podesta emails. This false narrative driven by a toxic combination of the Clinton campaign, the Democratic National Committee and the Obama Justice Department, the FISA court, State Department, FBI, CIA and other foreign policy intelligence operatives demands that Attorney General Barr immediately prosecute those involved in this destructive attack on our constitutional system of governance and the electoral process. Unfortunately, many will cling to the idea that somehow the President ‘obstructed justice’ in this process as Mueller neither exonerates nor condemns the actions of the President or any member of his team in his report leaving that determination to the Attorney General. Attorney General William Barr and Deputy Attorney General Rod Rosenstein make it clear in their letter to Congress that there was no obstruction of justice, exonerating the President and his team due to the fact that the essential elements of obstruction of justice were not found by the Special Counsel, including most importantly any underlying crime to obstruct. Regardless of the Mueller report and the Attorney General’s findings, the left will continue to cry obstruction of justice in the months ahead in an attempt to save face for dragging the nation through two years of doubt about the legitimacy of the Trump presidency. In doing so, the Democrats and some never Trumpers will be making the underlying claim that an innocent person targeted in a criminal investigation has no right to defend themselves publicly during the course of that investigation. This is absurd on its face and is nothing more than an attempt to obscure their own roles in this sordid attempt to take down a duly elected President. In light of the Mueller findings, the President should immediately pardon anyone who was convicted of a process crime resulting from the Mueller investigation, and the Attorney General should begin work on getting to the bottom of who perpetrated this Russia collusion fraud on the American public and begin the process of prosecuting them with the same vigor exhibited against the President and his team.